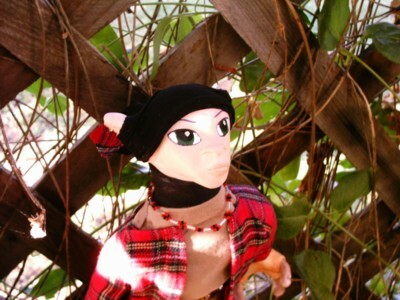 Tighe is a Scottish male Elf, about 15 inches tall. He is made of Polymer clay. 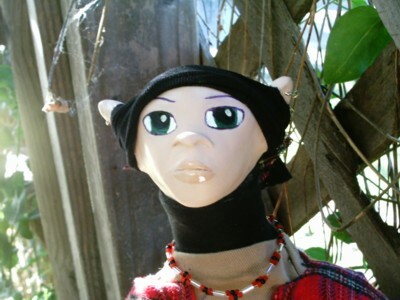 He wears a black nylon bandana and two gold colored hoop earrings in each ear. He wears a brown shirt, black pants, black nylon socks and a black nylon turtle neck. Over this he wears a red plaid shirt. 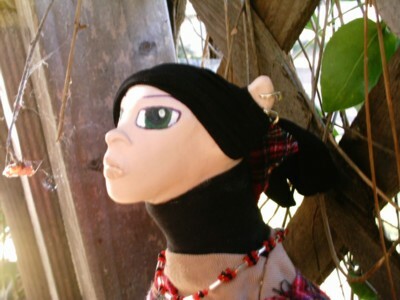 He also wears a hand beaded red & black necklace and a hand beaded tortoise shell belt. Tighe is an original creation made without the use of any molds. Tighe is colored with a variety of paints (both oil and water based), inks, and powders. His eyes are hand painted a beautiful shade of forest green. Tighe has large hands over which he wears fingerless gloves (made of clay) to look like worn leather.